A central panel of trellis cables is flanked by smaller cables and finally on either side the "Dancing Ribbons." Sleeves are worked in an easy broken rib pattern and a simple stand-up collar finishes the look. A classic drop-shoulder design that features the unusual but not difficult cables. Suitable for intermediate knitters. The pattern comes with instructions for 5 sizes, from XS-XL. Use any smooth DK weight yarn that knits to gauge (4½ st/inch). We would recommend Trendsetter M6, Supreme Possum Merino 8-ply, or Lang Novena. 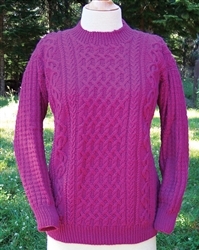 Uses any DK weight yarn that knits to 22st/28 rows = 4", using US 5-6 needles.